Since the 1980s, Christmastime has meant that those TV commercials for The Clapper and Chia Pet would deck the airwaves. Hearing “Ch-ch-ch-Chia” is as sure a sign of the impending holidays as eggnog and lights on housetops. Why would these ads air mainly at this time of year? I suppose the creators of these items believe that these two inventions make ideal gifts—ideal in that nobody actually wants this crap for themselves but the products are just good enough that people think that someone else may want them. The Chia Pet and The Clapper are brought to world by Joseph Enterprises of San Francisco, which also makes the “As Seen On TV” classics Ove Glove and Chimney Sweeping Log. The Chia Pet, “The pottery that grows,” has indeed become a classic Christmas gift—a classic gag gift. Back in 2003 my employer hosted a Christmas “white elephant” gift exchange, in which people were encouraged to give unwanted and offbeat items. I considered buying a Chia Pet but I thought that everyone had already received a Chia Pet at one time or another and that it was pretty hackneyed by then. But, sure enough, a Chia Pet was among the presents and everyone got a big kick out of it. So I guess the novelty value of Chia-Pet-as-gag-gift is still not played out. The ironic thing is that the instructions for the Chia Pet advise growing the pet in warm, humid weather—the kind of weather that is typically lacking in December. Sales of The Clapper are probably less due to its value as a gag gift (although it would make a pretty good one). The Clapper is more often bought as a gift for that great-aunt who lives halfway across the country and that you’ve only seen twice in your life. The old sea hag at the end who uses an arrhythmic clap to turn off the lights from bed. These days there are also licensed “Chia Heads” featuring such characters as Scooby Doo and even Mr. T. But my favorite Chia Heads are the ones that let you grow chia afros on bald characters such as Elmer Fudd and Homer Simpson. 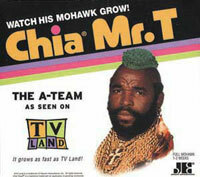 The Chia Pet was available at Ames and Woolworths…both chains no longer exist. I haven’t seen the Clapper commercials for the last two or three holiday seasons. I figure it’s because they finally realized that the old lady at the end died 25 years ago and they dropped them.